The New York Post reports that Julius R. Nasso, a "film producer and former business partner of actor Steven Seagal" and "reputed mob associate" is now "turning to" the White House and President Obama for a presidential pardon. In 2003, Nasso given a one-year sentence in federal prison for "teaming up with the Gambino crime family to shake down Seagal." 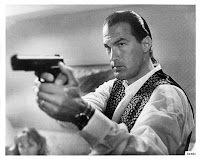 Prosecutors argued that he asked Gambino "captain" Anthony "Sonny" Ciccone to pressure Seagal "over money the producer felt he was owed when the action film star supposedly backed out [of] several movie projects." Nasso says,however, that he is “NOT an associate of organized crime.” See full story here.